In his thoughts on art and experience, John Dewey distinguishes between three forms of human activity. The distinctions are as follows: labor, play, and work. The differences between these three kinds of activity are qualitative and immanent to experience, and they each are distinguished by the relationship between effort and ends. Bear with me here as I lay out the differences between these three related concepts. Labor is experience that is instrumental. We are in a state of labor when there is no real connection in experience between the activity we undertake and the final product of that activity. We have all participated in this sort of activity: it is effort that takes us nowhere, does not develop or enrich experience. It is effort that is spent without return, or perhaps co-opted by interests that are actually opposed to the one who is putting forth effort. Labor is effort that is organized around certain ends, but the ends are in opposition or at the very least unrelated to the effort that is put forward. Play is experience that is spontaneous and not organized around any specific purpose at all. The efforts that we put forth in play are enjoyed immediately, without reference to any overriding purpose. Play is full and sufficient in itself, but for that very reason it is not intelligently linked to the development of life. The enjoyments of play are momentary and often rich, but whether they are carried forward into future enjoyments is a matter of chance because it is not intelligently directed. Work is experience that combines and completes the two other modes of human activity. Work consciously takes the spontaneous joys of play and links them explicitly, intelligently, and with some effort to future ends. Work is activity that links the spontaneous elements of experience with organizing ideals, drawing a straight line between the ideals, needs, and desires of a living organism and the spontaneous efforts that it puts forth. For Dewey, work is the most complete form of human experience, combining the spontaneity of play with the directed intelligence of labor in order that the living organism develop itself freely towards its imagined ideal. It is in work that experience gains its full aesthetic promise. This is what we see in the great work of art: the ideals of human imagination expressed through spontaneous and highly refined labor. The work of art shows us the promise of human intelligence, that our dreams can be made real through the careful and often strenuous working through of the materials of experience. I did not set out in this post to set out an abstract and probably difficult three-fold philosophical distinction. I set out to elaborate on the difference between running and training. I wasn't quite sure how to form this distinction, and my thoughts kept drifting to extremes. I wanted to juxtapose "running," a type of absolute free play with "training," a type of labor in which the joy of running is subordinated to the goal of the athlete. But Dewey helped me to see that this is the wrong way to think about the different modalities of running experience. After having spent 9 months training--preparing myself specifically for the goal of running a PR at Baystate--the goal had begun to diminish the running experience. Just as my running had been motivated and driven in large part by the possibility of running faster, it has been equally nice this last month to just be running without any particular goals, to be closer to the state of play, further from the state of labor. So, I had the temptation to write a post in praise the play of just running at the expense of the sometimes grueling and definitely tiring labor of preparing for a goal race. But this impulse would really be unfair to that former self who was cranking out the miles this summer, not because he was at play, but because he had something he wanted to achieve. Dewey showed me that I was thinking about it the wrong way. The alternatives are not as simple as labor or play. The real difficulty of taking up running intelligently is making it into a practice of work. There are moments when we will be caught up in the delightful rapture of a training run or race, when thoughts of training are chased from the mind by the immediate experience of the run: powerful limbs, skating feet, the mild rush of endorphins, the effortless effort. There are other moments when the act of running seems mechanical and uninspired. We run sometimes without any idea why, or for distant goals that frustratingly haunt us. There are moments when it only seems like so much meaningless plodding, wasted effort. These are the two extremes between which we alternate, the extremes of labor and play. Neither of these is enough, however, to make sense of why we run; as extremes of the running experience, they both distort its meaning. We run because it is a practice in which the joys of play can be linked up with the efforts of labor. We don't run for pure play, and we don't run solely for the sake of our training goals. We run in order to work our experience, our bodies, our selves, into an integrated and consummated whole. We run to prove that improvement can be joyful, that effort can be appreciated, that the goals that sometimes tyrannize us are also the dreams and fantasies that motivate us. We run because we like to work. If we stay at this work long enough, we develop into the selves we want to become. We learn to appreciate both the spontaneous joys that running offers as well as the hard tasks that it sets us, and sometimes we become artists of the running experience. We become able with our legs, our imagination, our will, our guts, to channel the loose ends of experience into and through fixed purposes. Or, sometimes, to loosen up our fixation on purposes in order that there be room for their creative reconstruction. 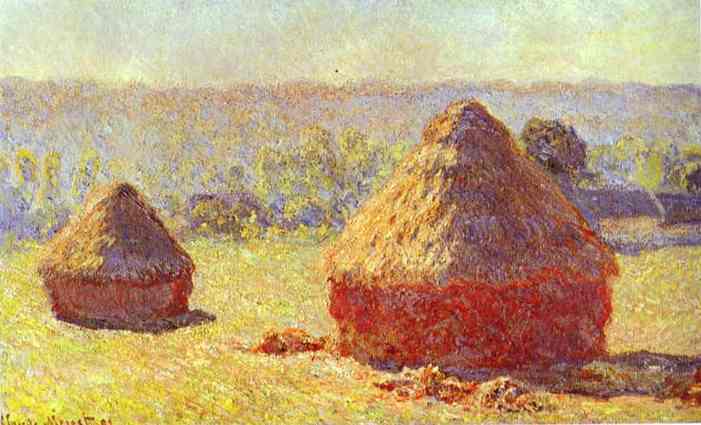 Monet combines the joy of perception with the skill of genuine reproduction. He's an artist. In short, we produce the kind of control that the great masters of experience have always had: the ability to link up the wildest of human passions with the discipline of intelligence. We run, in short, because running shows us how to make our experience into a work of art--and through this process we grow and learn. We play, we train. We do both. We run. at this moment, i am tasked with neither playing nor running, but instead with fulfilling an obligation to the man who signs my paycheck. "the man" as it were. i clicked my feeds on accident and see that you've posted another chewy morsel. i shall be back later to masticate it. Jeff, I really enjoyed reading! Great thoughts expressed here and applicable to other endeavors as well. This describes the experience I have where I run (or sing) for joy, but reach a point while doing so where I experience some limitation which kind of cuts off the joy and prevents the freedom I'm seeking. So then I work to overcome the limitation so that I can experience more freedom and joy. SMM, thanks for your comment, and thanks for reading. Avocational Singer, that's a great way of putting it. I like how you draw connections between your running and your singing. Those resonances between the various skills we have are fascinating. Thanks for sharing! ace, hope you had a chance to masticate. This post needed a lot of chewing.